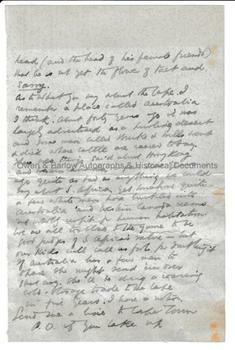 RUDYARD KIPLING Autograph Letter Signed. British (English) author and poet. Author of 'The Jungle Book' etc. Last 2 pages of a longer ALS but, nevertheless, with interesting content dealing with Australia, the South African Cape Colony, etc. ". . . head and the head of his fervent friends that he is not yet the flower of tact and savvy. As to what you say about the Cape, I remember a place called Australia I think about forty years ago it was largely advertised as a burning desert and some men called Burke & Wills went and died where cattle are reared today. There were things said about Hong Kong and Western Canada a few score years ago quite as bad as anything we could say about S. Africa, yet somehow quite a few white men have tackled into Australia and Western Canada seems not wholly unfit for human habitation. We are all too close to the game to be good judges of S. Africa's value - but our kids will call us fools for doubting it. If Australia has a few men to spare she might send them over that way. She'll be doing a roaring cold-storage trade to the Cape in five years, I have a notion. Send me a line to Cape Town P.O. if you take up the army reform question. It must be done from outside the ranks of the regular army & we need every man's help. Yours sincerely, Rudyard Kipling." 15 x 10 cms (6 x 4 inches). 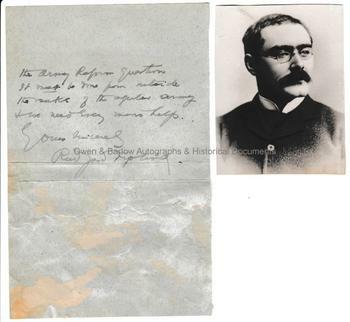 With a contemporary photographic portrait of Rudyard Kipling from a post-card. Slight creasing. Mounting residue to lower part of verso leaf, else very good.